This was a recent addition that I absolutely LOVE. Now, I know one or two of you may be crinkling your noses at the thought of having brussel sprouts, but seriously, just go with me on this. Have I ever lied to you before? Perhaps you don't like the brussel sprouts because they weren't prepared properly, no? Even if you've passed on them in the past, I think it's time to give them another try! And seriously, they're cooked with bacon and you KNOW everything is better with bacon, right? So PLEASE! Give them a try! You just might be surprised! And who knows, maybe they'll become a permanent part of YOUR holiday meal! Using a sharp knife, cut the bacon into small pieces and add them to a large skillet over medium heat. Slowly let the fat render from the bacon. Dice the onion and add it to the skillet. While they're cooking, prepare the sprouts. Slice each one in half, making sure to slice through the root end. When the onions are soft and the bacon is crisp, remove them from the pan, leaving the bacon fat behind. Add the sprouts to the pan, making sure they're cut side down. I know you'll want to toss them around in the pan, but try to control yourself. Just let them sit until they begin to caramelize on the bottom. Now add the chicken broth, salt and pepper. 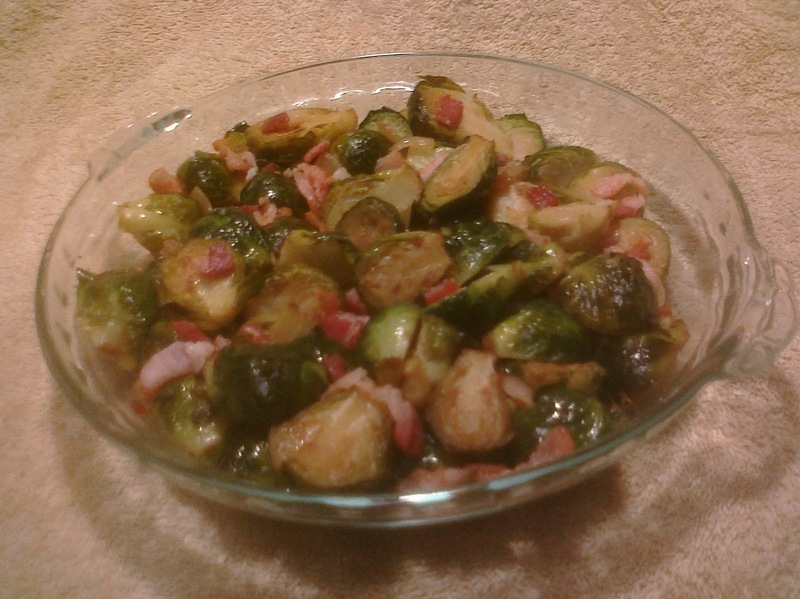 Place a lid on the skillet and simmer until the sprouts are tender. (Add more broth if you need to). When the sprouts are tender, add the bacon and onions back to the pan and toss all together. Serve immediately. Be sure to cook the bacon and onions over medium low heat. You want to gradually render the fat. If you have the heat up any higher, you'll quickly brown the bacon into a crisp but you won't get as much fat to render. It's important to cut the sprouts though the root end because if you cut them in the other direction, they'll fall apart. As far as I'm concerned there's just no comparison between fresh and frozen brussel sprouts. I'm not sayin', I'm just sayin!